Stock up on sterling silver stamping blanks in time to make your holiday gifts! 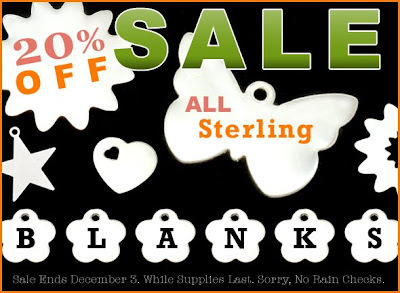 All sterling blanks (even the new ones) are 20% off until December 3rd. A few of our blanks are out of stock. They are on backorder, but we are not sure when they will be in stock. There is no guarantee that they will be back in stock during the sale, but put your name on the "Notify Me" list (upper lefthand corner of each product page), and we will send out notifications as soon as they are back in stock!